This is my fourth photo tour detailing the bridges and structures of a great American river. In this survey, we visit the bridges and dams on the Minnesota River between its source at Big Stone Lake along the Minnesota and South Dakota state line down to the Minneapolis and Saint Paul metro area. The Minnesota River is important in a number of different aspects. In geological terms, the Minnesota was the primary outlet of the glacial lakes before the Mississippi River headwaters section was formed. In historic terms, the Minnesota was one of the first superhighways in the US, connecting the Mississippi and Ohio Rivers to the interior of Canada. In economic terms, the Minnesota flows though the heart of the vegetable canning area of Minnesota and home of the Jolly Green Giant. The source of the Minnesota River is a wetland area between Lake Traverse and Big Stone Lake. Water on the north side of this wetland flows north via the Red River and drains into James Bay, while water on the south side of this wetland flows down the Minnesota and Mississippi Rivers, emptying into the Gulf of Mexico. 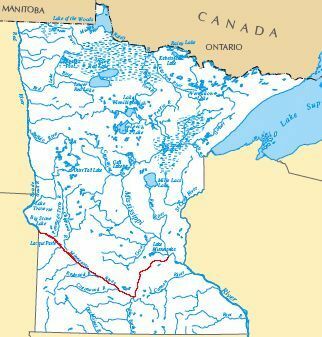 The upper Minnesota River is little more than a small stream meandering through the bottom of a large river valley that runs the width of the state. The river is no more than an echo of what it once was as the rock moraine holding back glacial lake Agassiz crumbled and unleashed a torrent of water that cut a 130 foot deep gorge across the state in as little as a few weeks some 8,000 years ago. The lower Minnesota River flows through a rich farming area that is laser leveled and drain tiled. This gives excess water a direct path to the river. As a result, agricultural runoff and rainwater is often in the river within as little as 30 minutes, as opposed to the hours and days in generations past, setting us up for the monumental floods that we have seen over the past fifty years. The last miles of the Minnesota River are surrounded by the Minnesota River Valley National Wildlife Refuge. This refuge is unusual in that it cuts through a major metropolitan area. It is amazing to find so many square miles of protected wildlife refuge located in the heart of a major city.